I am guilty of being the guy who says to other comic book readers, "It's a comic book. It doesn't have to be that realistic." While my point may have some level of validity, it is generally a poor argument for a plot or idea that isn't working for a group of readers. There are levels of reality in comic books. If you are reading a Rogger Rabbit comic the reality level is low, thus the plot can be zany and not make a ton of sense to work. On the opposite end of the spectrum there are books like Stumptown which is a real life take on a private detective. The ideas behind a book like this have to absolutely be based in real life. If randomly when the P.I. shot at a bad guy a cartoon bullet came out of her gun and started talking to the bad guy the book would loose it's tone and respect by current readers. There are also middle ground comic books which are reality based accept for the fact that there are superheros. Basic real life rules are still in place and people act normal, but there are some individuals with extraordinary abilities (flight, super strength, telepathy, etc.). The middle ground is where a book like Thunderbolts #144 can be found. Thunderbolts exists in the world of real life with a hint of superhero. Thunderbolts is a comic based around a group of convicts or ex-cons working as a government backed team to fight super-crime. The idea is...society might as well use these super criminals' abilities to it's advantage rather than just having the criminals waist away in prison. It seems like an idea that could possibly be hatched in real life. It may have some ethical issues which would need to be explored, but I could see a government rationalizing the Thunderbolt program. However...some people always throw in a "but"...I throw in "howevers" (plural form of however - not a real word...whatevers). As I was saying...however, while a government may use some criminals for their abilities I find it highly unlikely that they would use criminals who are more prone to super violent acts or criminals who enjoy making their kills suffer. The last team use Bullseye who fit my above description of an uber-violent super offender, but he gets a reality pass because Marvel had placed a man in charge of the Thunderbolts program who had a warped mind himself: Norman Osborn. Osborn had a way of convincing the government that the Thunderbolts could be controlled no matter what they had done in the past. Osborn got his way and so I bought the violent offender being added act. But after Osborn was removed and his "Dark Reign" cleared away one may think the next group of Thunderbolts may lean towards a team with non-excessively violent characters. One would be wrong. In Thunderbolts #144 the new team adds a non powered villain who not only has murdered so many people over the years, but he has also tried to over throw the government with the Red Skull and kill the national icon Captain America. 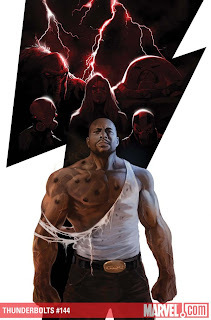 Crossbones was chosen to the team with the excuse that he is needed because some of the other villains may relate to him more than the new leader and ex-con Luke Cage. The government is saying that if the super criminals don't like cage, maybe they can look up to this insanely violent murder for inspiration. To me this is where Thunderbolts #144 seems a bit far fetched...even for comics. After the terrible things that occured in the Marvel Universe after crazies like Osborn and Bullseye were running around, why would the government put more extra-violent people back into the mix? They wouldn't. Though I enjoy the characters and even the story so far in Thunderbolts #144, I still do not buy the premise of this team in this comic of the day.